Aviation significantly improved and broadened channels of communication with the introduction of airmail. Post could reach far and wide to help connect communities and cultures. 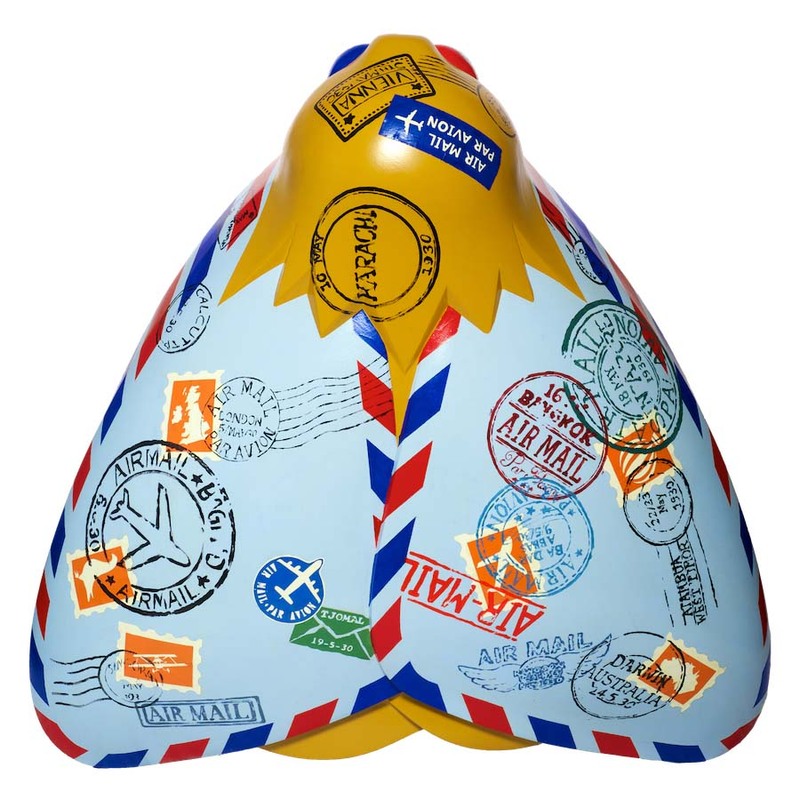 This moth charts Amy Johnson’s flight path and timeline; each date stamp corresponds to the time that she touched down in each country, highlighting her journey from England to Australia, which is also depicted on the postage stamps. The additional stamps depict the different ways that post has taken to the skies – from the basic carrier pigeon and balloon to the various aircraft of more modern times. David Graham is the Head of Creative Arts in an all girls’ school in Liverpool but also works as a freelance artist and graphic designer. He works with a wide range of 2D and 3D media and his portfolio includes photography, collaborative community projects including mosaics, public murals and graffiti knitting. In 2009, he staged an exhibition of his pupils’ artwork on The Fourth Plinth in Trafalgar Square as part of Antony Gormley’s One and Other project. More recently, his designs have appeared in Wild in Art sculpture trails in Birmingham’s The Big Hoot and Salisbury’s The Baron’s Charter. Rollits LLP is a leading regional law firm with offices in Hull and York. Founded in Bowlalley Lane, Hull in 1841, the firm, which is firmly rooted in the city, is proud to celebrate its 175th birthday this year. Rollits builds its core values on integrity, innovation and teamwork to deliver a trustworthy service from a strong team of legal experts.